With campaigning for Friday’s Presidential vote formally ended at 8 a.m. local time (0330 GMT), most candidates tried to boost support and win over the undecided with rallies. 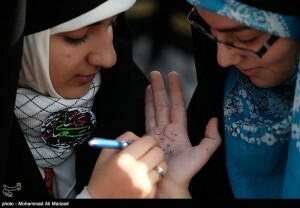 The most notable of these, in size and volume, was from Mashhad for the moderate Hassan Rouhani. 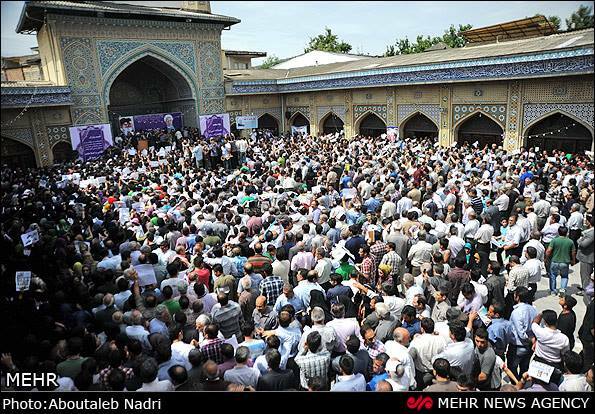 Amid signs of a continuing surge for the cleric, following the formation of a moderate-reformist coalition, tens of thousands chanted and sang for “freedom” — including for political prisoners such as 2009 candidate and opposition leader Mir Hossein Mousavi. Informal gatherings were also held throughout the country, notably in the major squares and streets of the capital Tehran. Groups — sometimes numbering in the thousands — came out for Rouhani, Tehran Mayor Mohammad-Baqer Qalibaf, lead nuclear negotiator Saeed Jalii, Supreme Leader advisor Ali Akbar Velayati, and Mohsen Rezaei, the former head of the Revolutionary Guards. The rallies both highlighted and overtook another interesting development: the apparent concern of the regime, including the Supreme Leader, over voter turnout. The BBC issued a statement on Thursday evening condemning Iran for harassing and intimidating the family members of BBC Persian employees ahead of Friday’s Presidential election. Radio Farda previously reported a similar situation. The BBC is very concerned by the unprecedented levels of intimidation being suffered by families of BBC Persian Service staff living in Iran in the final days of the presidential election campaign. In the past few days alone, 15 family members have been summoned for questioning by the Intelligence Ministry in Tehran and in other cities across the country. The harassment has included threats that relatives will lose jobs and pensions and be prevented from travelling abroad. For the first time the lives of BBC Persian TV staff living in the UK have also been threatened. The BBC condemns this completely unacceptable harassment against our Persian TV service and other media organisations and independent journalists. Despite this intimidation and crude attempts to discredit our journalism, BBC audiences in Iran have almost doubled to 11.8m. This recognition by ordinary Iranians is a tribute to the professionalism and resilience of our journalists, and to the value of their work delivering unbiased news and programmes to Persian-speaking audiences. 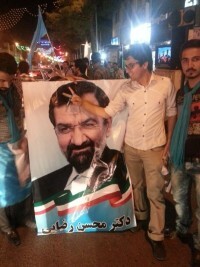 Looking back at an election campaign by eight — eventually whittled down to six — candidates that the Western media has dismissed as indistinguishable, it is interesting to read this blog post by Garrett Nada of USIP’s Iran Primer, who has highlighted the various campaign posters produced by the candidates’ campaign teams. Nader discusses the various buzzwords and slogans each candidate has used to differentiate themselves and grab public attention. It is hard to predict whether there will be a large turnout at Friday’s poll. Both Aref and Rouhani have called on their supporters — who range from moderates through reformists and even some of the Green movement — to turn out and vote, saying that to do so will make a difference. A large turnout could therefore give Rouhani the edge he needs to go through into the second round, which will most likely be against Ghalibaf. 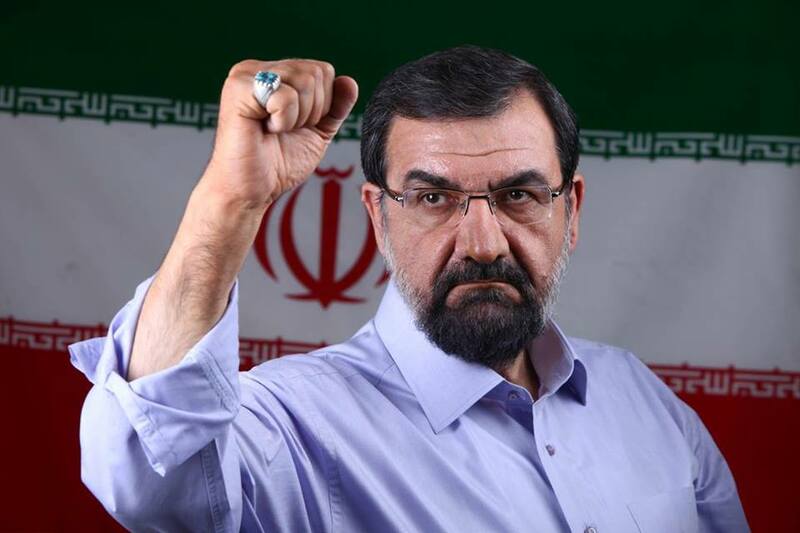 Independent Presidential candidate and former IRGC commander Mohsen Rezaei tweets these two photographs, just hours before the polls open in Iran. The second is captioned, on Twitter: With All My Power, I Have Arrived. This photograph, from a Rouhani supporter, shows a woman wearing the moderate candidate’s key emblem and a purple ribbon, the color of Rouhani’s campaign. He said that, accordingly, “in order to improve relations with the neighboring countries, Saudi Arabia is Rouhani’s top priority.” Bank pointed to Rouhani’s service as the secretary of Iran’s Supreme National Security Council for over a decade and the relationships he has built up with leaders and officials of neighboring states as proof of his ability to bolster relations. Bank added that regional governments would be eager to deal with a moderate government in Tehran, making the chances of success of Rouhani’s outreach more likely. 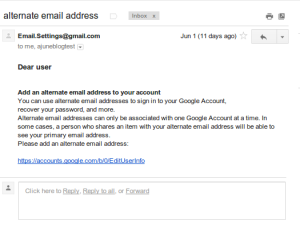 Google reports on its security blog that in the past three weeks, the company has detected and stopped a number of phishing attacks directed at Iranian Gmail users. 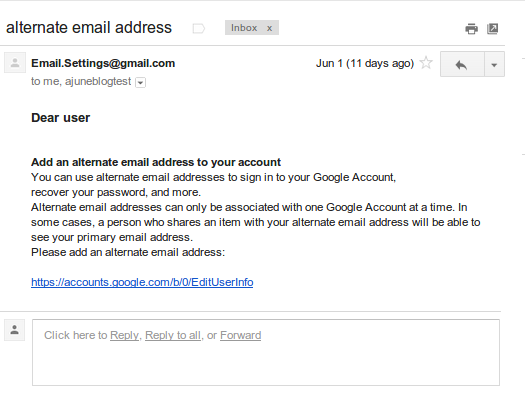 Google suggested that the attacks were likely to be politically motivated because of the upcoming elections. Phishing is an attempt to trick an email recipient into revealing confidential information, usually their password, by pretending to be a trustworthy person or organization. بایکوت بزرگترین همایش انتخاباتی کشور در مهمترین بخش‎های خبری سیما. 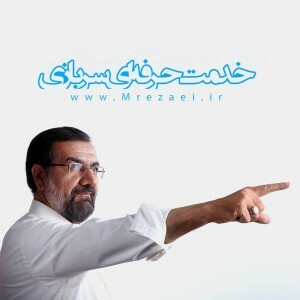 تصاویر همایش همزمان دکتر قالیباف روی آنتن رفت، اما سعید جلیلی نه! درحالیکه در خصوص سایر نامزدها ترتیب حروف الفبا را رعایت می شود، پوشش برنامه‌های جلیلی در سه روز اخیر در صداوسیما به آخر انتقال داده شده است. PreviousSyria Today: How Many Were Killed in Hatla? And Who Did It?